Home Hibachi Grill Sizzles on Kickstarter. Successfully funded by food lovers all across the country, this appetizing idea will now become a delicious reality. Providence, R.I. (March 21, 2016) – Launched on February 27th and running until March 28th, the Kickstarter campaign for Partyaki home hibachi has beaten the odds, gaining full funding from backers in just over two weeks — no small feat, as only 18% of Kickstarter campaigns seeking $50,000 in funding actually succeed. The Partyaki is a compact hibachi grill that brings all the thrills of a Japanese steakhouse experience into your home: high-flying food tricks, delicious aromas, and fun with friends and family. It sits on a table or countertop with a 24”x15” stainless-steel grilling surface allowing for direct cutting with metal utensils, cooking for up to six people at a time, and easy cleaning. 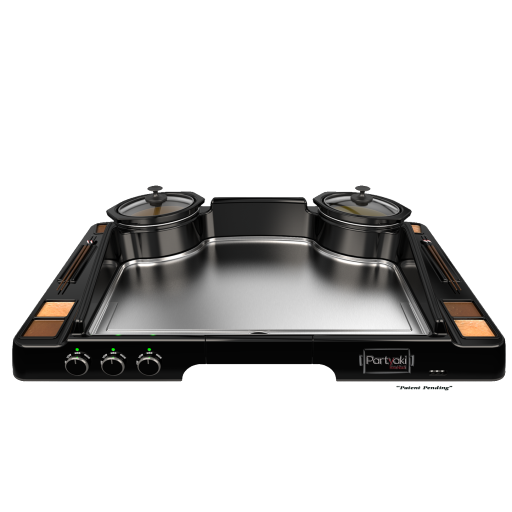 Partyaki’s innovative design also includes built-in chopstick holders, removable dipping sauce trays, and integrated hot pots which allow dinner guests to cook their own ingredients in flavored broth. To that end and also to thank the surge of backers on Kickstarter, Durant and Innoveek Co-founder Frank Safo this week announced Partyaki University, an online community. Partyaki University will feature tutorial videos teaching hibachi tips, tricks, and recipes from Teppanyaki Mike, Head Chef at Roku Sunset in Hollywood, California. Free subscriptions to Partyaki University ranging from one month to a full year (depending on pledge amount) will be given to every Kickstarter backer. Also announced this week was a new “stretch goal” for the Partyaki campaign: “We wanted to give backers a simple way to personalize their Partyaki,” said Durant. “So if we hit $75,000 before the campaign ends on March 28th, we’re going to let people choose the color of their Partyaki.” Backers will be able to choose a high-gloss finish of either black, red, or burnt orange. To get behind the Kickstarter campaign, visit: http://bit.ly/partyaki. You can also follow Partyaki on Facebook at facebook.com/partyaki and Twitter @PartyakiFans. The Partyaki home hibachi grill is estimated to be available for purchase in stores and online in the first quarter of 2017 with an MSRP of $499 and a street price of $399 (Pricing and availability subject to change). However, as of this writing, a limited number of the $249 Kickstarter pledge-level spots remain available, which gets supporters one of the first Partyaki grills to roll off the production line. Each one includes a recipe book, chopsticks, a teppanyaki spatula, professional salt and pepper shakers, sauce squeeze bottles, hot pot skimmers, and chef hats. The Partyaki is patent pending. We dream up innovative and fun products and then make them a reality, transforming great ideas into great experiences. Our goal? Products in your home that make your life easier and more fun. You want cool stuff. We make cool stuff. Because, why not? For more information visit www.innoveek.com or www.partyaki.com. Innoveek sets out to break the Internet with tasty Kickstarter campaign. Providence, R.I. (February 22, 2016) – After months of anticipation, Innoveek is set to officially launch its Kickstarter campaign on February 27th for PartyakiTM, a home Hibachi grill that brings the Japanese steakhouse experience to your kitchen. “Watching the food tricks, interacting with the chef, having fun with your family and friends — nothing has compared to a night out at a Hibachi restaurant … until now! Partyaki captures that experience and brings it into your home. Now, you’re the chef, and your kitchen is the center of the action,” said Jay Durant, Co-founder and CEO of Innoveek. The compact Japanese-style grill is built for a crowd with four seating positions, giving guests a front row seat to all the grilling action. Partyaki includes everything you need to start flipping shrimp into your hat like a pro. Years in the making, the Partyaki Home Hibachi began in Durant’s imagination and soon became a reality with multiple concepts coming and going until Innoveek had the perfect balance of features, size, and components. Partyaki is crafted with professional-grade materials, making it durable and portable. The grill has four seating positions but can accommodate up to six dinner guests. Each Partyaki grill comes with all the essentials, including chopsticks, a teppanyaki spatula, professional salt and pepper shakers, sauce squeeze bottles, hot pot skimmers, and chef hats. There’s also an optional storage and carrying bag. With a successful Kickstarter, the Partyaki is estimated to be available for purchase in stores and online in the first quarter of 2017 with an MSRP of $499 and a street price of $399 (Pricing and availability subject to change). Some early backers of the Kickstarter campaign will receive Partyaki as a thank you for contributing $250 to the effort.